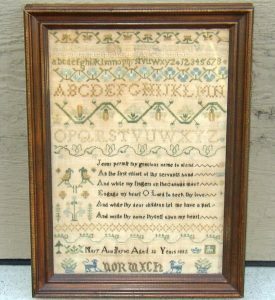 This sampler was done by Marianne Kennedy in 1846. There is a label on the back indicating that it was framed by “R Stewart and Sons, Fine Art Dealers, Artists’ colourmen and Frame Makers. 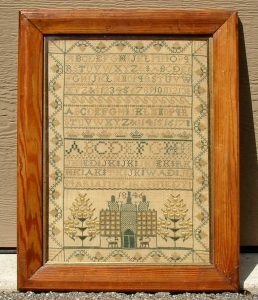 19 St John St and 16 Princess St, Perth.” It is a wonderful example of sampler stitching showing letters, a complex border and interesting figures. Note Marianne’s use of silk threads to highlight the trees at the bottom. 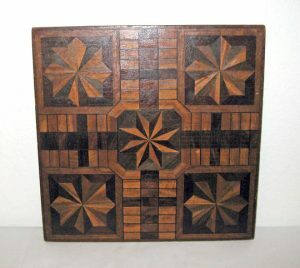 A very attractive and graphic inlaid game board – parchese on one side and checkers on the other. Nice selection of exotic woods and design composition. A special example in fine original condition. Early 20th C. 16 1’2″ square, 1″ thick. 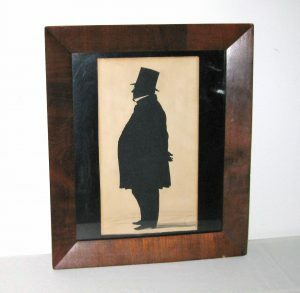 Large size “cut and paste” silhouette of a portly gentleman with the impressed mark of “Thomas Creswick” in the lower right corner. Floor accented with water color pattern. Silhouette size is 6 1/4″ by 11″. Excellent original condition. No tears, regluing or excessive toning. Thomas Creswick was a noted English painter (1811-1869). 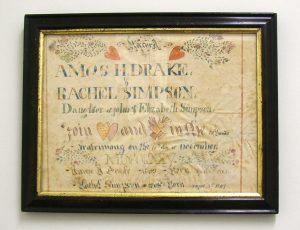 Nicely designed and executed 19th C. (dated Dec 15, 1825) marriage fraktur for Amos H Drake and Rachel Simpson and signed by the artist W C Stevens. The couple were from Warren County, NJ. Amos Drake served as a member of the NJ State Assembly from 1846-48. He was born in April 1803 and died in January 1873. His wife, Rachel, was born in August 1807 and died in October 1853. They had one daughter, Asenath (1831-1839). Some line repairs to the paper. A very attractive and well balanced composition along with strong colors and fine condition make this sampler by Mary Ann Payne, aged 12, a desireable example. 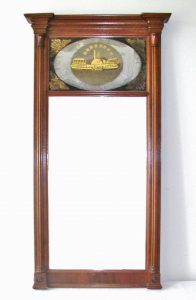 It is dated 1832 and identified with the town of Norwich. It is stitched on fine linen and is probably of English origin, though it last resided in a home in Norwich, CT. Conservation mounted and framed. 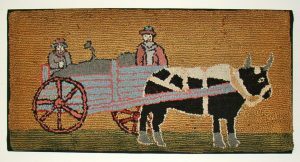 An interesting folky hooked rug depicting an early farm wagon with a family and their ox. The material of the rug is a very unusual mixture of natural and dyed jute as well as the traditional hooking cotton. 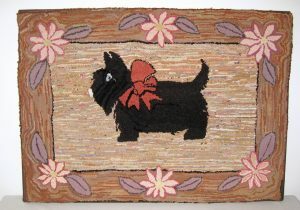 The combination of materials along with its design and its fine original condition make for a desireable piece of folk art. Found in a Vermont collection. 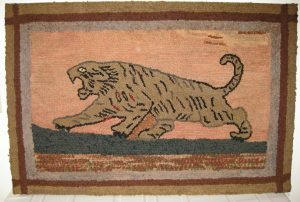 Rug is 17.25″ x 34.5″. 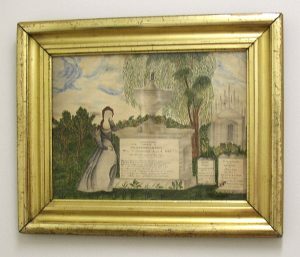 A very fine early 19th C. American watercolor mourning tribute to Anthony Budlong Patt of Rhode Island. Born in 1795, he died April 4, 1827. He was the son of William Patt and Rebecca Stone. His 1st wife was Cynthia Carpenter, who died in 1821. They had one daughter, Cynthis Patt, who was born in Providence, RI. Anthony Patt married a 2nd time to Catherine Arnold who was born in Windham, CT.